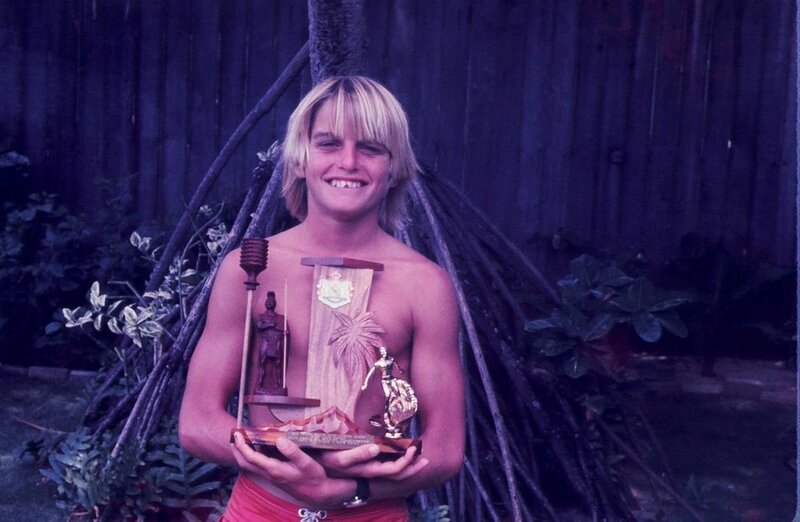 Buzzy as a young lad - the Kailua Kid - with an HSA trophy won at Chuns. He filed his teeth to points to be savage, like the Polynesians. Not. Buzzy's win in the amateur event of the 1978 World Cup propelled him into pro surfing, and the early days of the ISP. Currently working with Buzzy Kerbox on a scrapbook of his life: Early years, pro surfing, modeling, stunts, tow surfing, SUP and His Three Sons. In the intro to the book, I argue: "Anyone who has played a part in history owes a debt to history to detail the part they played." And I mean that. Buzzy has had a colorful life: I compare him to Dorothy in The Wizard of Oz: Whisked away as a boy from Indiana and deposited in an exotic land of color and rainbows - the Hawaiian Islands. Buzzy stumbled into modeling. Bruce Weber took some photos for Vogue that Ralph Lauren saw. And what Lauren saw in this Hawaiian surfer was east coast preppy - a smile Kennedyesque dude. And that lead to a healthy contract modeling for Polo, hanging out at Studio 54, etc. This is Buzzy getting his Robert Palmer on with some models in the desert. Tow surfing and all its tributaries leads back to Buzzy and Laird Hamilton standing on the beach at Backyards, with one finger in their ears and one in their exhaust manifolds, with the wrong boat, the wrong boards and the wrong engine. They gradually got an act, and changed big wave surfing forever. This is Laird and Buzzy with Darrick Doerner making three. The ocean was Buzzy's Yellow Brick Road and this book will detail his adventures as a pro surfer, Polo model, stuntman, tow surfer, long-distance and competitive paddler, standup paddler and father of three. The Buzzy Book will be full of color - art directed by his talented wahine Barbara Kraft - and hopefully - like tow surfing and SUP - the world will say: "Aw what is Buzzy doing now!!!" And then everyone will see how cool it is, and what to do one and repay their own debts to history.